Except for kitchens, bathrooms, and other damp areas, hardwood flooring is a classic material generally regarded as a premium flooring for almost any room in the house. Bedrooms are no exception. While the warmth, coziness, and sound-dampening qualities of carpeting are quite popular in bedrooms, many homeowners are now removing carpeting in bedrooms to either expose the existing hardwood or lay solid hardwood or engineered hardwood planks during remodeling projects. The visual warmth and natural appeal of real wood make it very appealing from a design perspective. Here are some things to keep in mind when considering hardwood for flooring in your bedrooms. Hardwood has been used as a flooring material for centuries, and despite radical shifts in trends and times, it has never gone out of style. The bedroom is a place that people often feel compelled to ‘recreate’ every few months with a new design. One big advantage of hardwood is that it will look amazing with just about any decorative treatments that you undertake in this space. Hardwood flooring is available in many wood species with different grain patterns, and it can be stained in an almost infinite range of hues. Top-coatings can range from glass-like gloss to a subtle matte finish, and hardwood flooring serves as the perfect backdrop for ornamental rugs and furnishings. A bedroom is a place of quiet serenity and soft vulnerability, where shoes and socks are often left off and bare feet press directly against the floor. Traditionally, this is the single most important reason why carpet has been so popular for bedrooms. While wood is softer and warmer than ceramic and porcelain tile, it is still relatively stern and can get chilly in colder regions. That’s why the use of rugs can be a great way to warm up the space while also accenting the inherent beauty of the flooring material. In a bedroom with wood flooring, area rugs are often used to delineate different areas. A small carpet can set aside a space for dressing, or as a reading area, or a work/study space. You can also center a large piece of carpet or a large, plush area rug around the bed to provide warmth beneath your feet when you slip out of slumber in the morning. One of the biggest problems with carpet and other soft flooring materials is that they tend to collect dust, pollen, and other small irritating particles. These are then released back into the air every time someone walks across the room, creating a hazy atmosphere filled with invisible debris which can irritate sensitive lungs and sinuses. With hardwood flooring, the surface is smooth and solid, ensuring that all particles can be easily cleaned away. Area rugs can be periodically removed and cleaned to keep dirt and allergens at bay. A bedroom is a space where people spend many hours each day, and for those who suffer from allergies, asthma, and other breathing disorders, hardwood flooring is one of the very best options. Hardwood flooring is among the easiest of floorings to maintain. Simple sweeping and wiping with a dry cloth will keep dirt and dust at bay, and there are no places for dirt to hide. Hardwood flooring will, however, need to be refinished at some point—a process that can range from a simple reapplication of varnish to full stripping, sanding, and application of a new top-coat. But a hardwood floor kept clean may go decades before refinishing of any kind is needed. And the simple fact that hardwood flooring can be refinished is one of its main advantages: Carpeting typically needs to be replaced every 10 years or so, while hardwood floors have been known to last as long as the house itself. If you have dogs, especially large dogs, their toenails tend to scratch up hardwood bedroom flooring surfaces. This can be mitigated to some extent by keeping pet nails trimmed or simply banning them from the boudoir. For some people, the tiny nicks and scars are actually desirable, giving the floor a patina and sense of personality that evolves over time. But the reality is that pet dogs do somewhat complicate the maintenance of hardwood floors. In bedrooms used by children or elderly people, or anyone with balance issues, you should remember that hardwood is a rigid flooring surface that can cause injury if falls occur. It does not have the cushioning effect found with carpeting laid over a resilient floor pad. Large soft area rugs can offer protection, but rugs themselves can create a tripping hazard, especially for elderly people. Toddlers are fairly resilient, but for anyone vulnerable to injury, other flooring options, such as carpeting or luxury vinyl, may be better choices. In an upper-story bedroom, you may have reason to be concerned about the transmission of noise that can occur with hardwood flooring. Not only do you have to worry about creaks from shifting floorboards, but even the tapping of shoes as you walk across the floor can be translated as thumps to people dwelling down below. This can be especially troublesome with active children in a bedroom directly above downstairs living spaces. The biggest problems will occur when the hardwood is installed incorrectly, causing the planks to shift and creak when walked across. You can also dampen the transmission of sound by having an insulating underlayment installed beneath the hardwood. Another option is to deaden the noise from above by spreading area rugs and carpets throughout the room. You can find some woods selling for as little as $1 to $2 per square foot, but in general, a high-quality hardwood flooring will cost closer to $10 per square foot or even more. This makes hardwood more expensive than most carpet and other flooring options, such as vinyl. Remember, though, that this is only the initial investment, and a well-maintained hardwood floor can outlast other less-expensive options by decades, saving on replacement costs. For homeowners looking to save money by doing the installation work themselves, hardwood flooring may not be the best choice. Laying solid hardwood plank flooring is a specialized skill that is best handled by professionals with lots of experience. This is an expensive flooring material that you want to get right. However, there are some engineered hardwood flooring materials—products made by bonding a surface hardwood layer to a laminated base—that are easier for DIYers to install. These products may use a "click-lock" assembly method that is considerably easier than the blind-nailing process used to install solid hardwood tongue-and-groove planks. Be aware, though, that these engineered hardwood flooring products do not have the longevity of solid hardwood plank floors. Generally speaking hardwood floors are more difficult for DIYers to install than other non-carpet flooring options, such as laminate, vinyl, or even ceramic tile. When choosing a flooring, you may want to consider the impact on real estate value, especially if it's likely you will be selling your home in the foreseeable future. New flooring is sometimes installed for the sole purpose of making the property more appealing to buyers, especially if the old floors are damaged. Hardwood floors, while they are generally attractive to prospective buyers, do not really earn back the cost of installing them. So if you want hardwood floors for your own enjoyment, you can be confident they won't turn off future buyers; but if the goal is simply to get your house prepared for sale, there are other flooring materials that make better financial sense. A good quality laminate, for example, is considerably less expensive than hardwood, and will make your home look quite good to prospective buyers. Installing hardwood floors is a good investment if you plan to enjoy them for a number of years, but not if your goal is preparing your home for imminent sale. They will raise the value of your home, but not by the amount it costs to install them. If you already have hardwood floors, however, sanding and refinishing them can be an excellent way to prepare your home for sale. 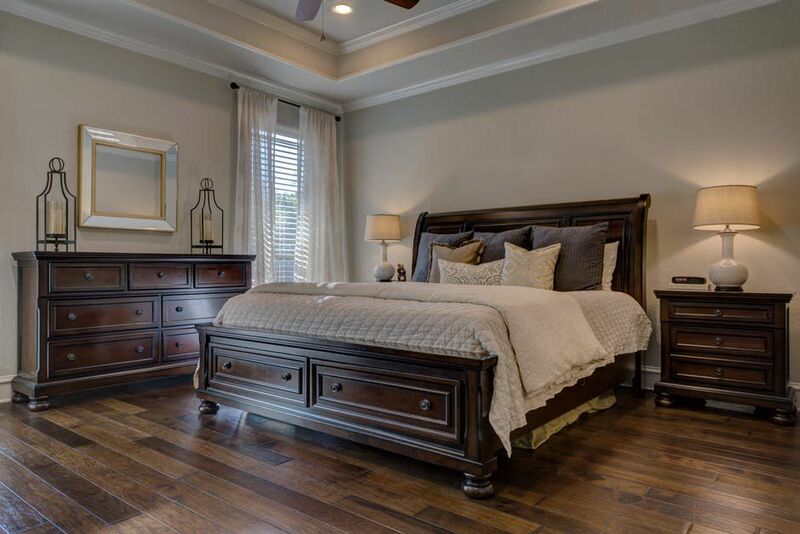 While it is not as soft as carpet, the traditional bedroom flooring choice, hardwood is still a warm, welcoming feature when used as a floor surface in this room. Its natural beauty, durability, and ability to stand the test of time for both style and durability make it a wonderful long-term flooring material for this serene and settled location. What Is the Country Cottage Style for Bedrooms?